Alien Huang to leave "100% Entertainment"
8 Dec - Taiwanese singer Alien Huang revealed recently that he is leaving variety show, "100% Entertainment", after ten years. According to Epoch Times, the singer revealed the news recently at the signing event of his new album, "ALiEN", in Banqiao District of New Taipei, saying that he plans to concentrate on his new album and drama. 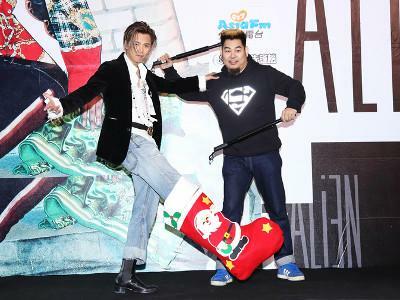 When asked if it has anything to do with his supposed conflict with Show Luo, who is also his co-host on the show, Alien denied it, saying that there is no awkwardness between them. Alien also revealed that he will be busy promoting his album overseas soon, and is currently preparing for his New Year's Eve show in Yilan. The singer made his debut on "100% Entertainment" as a temporary replacement for original host, Dee Hsu, who was on maternity leave back in November 2005. However, a year later, he was promoted to fixed host alongside Show Luo and Linda Jian. Dingdong Dantes to play lead in "Descendants of the Sun"